Acrylic 8mm beads with large 4mm horizontal holes for easy side-to-side stringing. 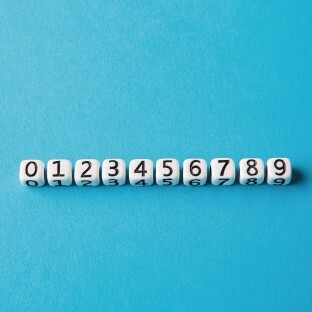 Combine Number Beads and Letter Beads (BE1320) to spell just about anything. 50 pieces conveniently packed in zip-top bag for easy storage. Acrylic 8mm beads with large 4mm horizontal holes for easy side-to-side stringing. Combine Number Beads and Letter Beads (BE1320) to spell and say just about anything, like team, club or camp names! 50 pieces are conveniently packed in a zip-top bag for easy storage. Please specify number 0-9. Nice looking solid. Used to make bracelets with the year. turned out cute. Used to make jewelry pins for Girl Scouts SWAPS. These were perfect for our project. It was great being able to purchase exactly what we needed and not have to get beads that would not be used. Price was very good and the quality was actually a surprise much better than at local craft stores. I made key chains/bag tags using bible verses. The numbers are bigger than the letters. Please provide letters and numbers that are the same size. The children are avble to handle and use without any assistance from me!